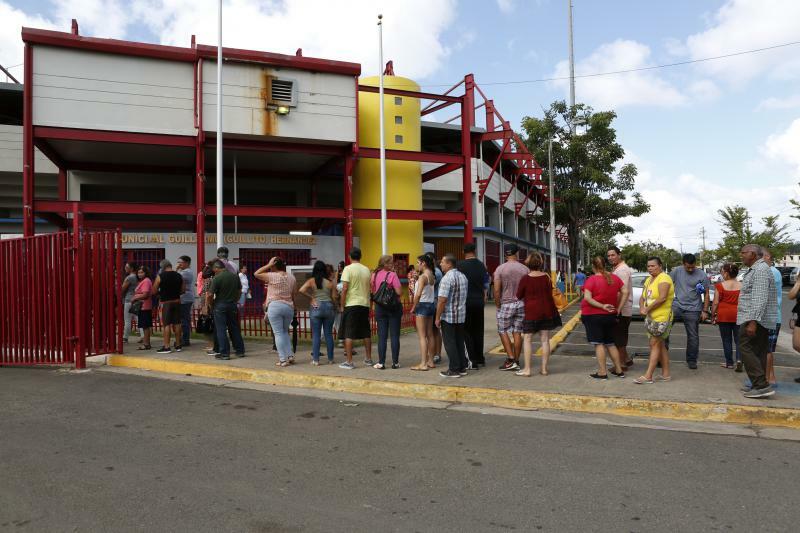 People in Aguada, Puerto Rico line up at a distribution center running out of the municipal baseball stadium. The center receives food aid from FEMA contractors and other private donations. GPB's Emily Cureton speaks with Rickey Bevington from Puerto Rico, where an Atlanta-based contractor was supposed to deliver nearly 20 million meals. Instead, only 50,000 were delivered. EMILY CURETON: Her name is Tiffany Brown. And news of her operations came out during a U.S. House inquiry into the recovery of Puerto Rico. Those House documents show Brown hired a Georgia-based wedding caterer and essentially subcontracted the making of the meals out to them, then funneled them through a Texas nonprofit. And neither the caterer nor the nonprofit was able to accommodate the demand. And by that time Brown made more than a quarter of a million dollars before the contract was canceled. BEVINGTON: A FEMA administrator called Brown’s operation a “logistical nightmare.” FEMA says nobody went hungry as a result of the millions of missing meals. Is that what you're seeing on the ground? CURETON: Well Rickey, it’s a lot more complicated than that I think. It's not just about access to food, It's about the affordability of the food. I'm driving around the island. I've traveled about 150 miles this week, and I've seen business after business after business in towns that are closed and shuttered up. I'm seeing neighborhoods full of abandoned homes. I've personally been to about half a dozen grocery stores, and inside you could be anywhere in the mainland US. The shelves are stocked, the prices are on par with what we'd have in Atlanta. Plus, Puerto Ricans are paying 10.5 percent sales tax. So there's food on this island but people are losing their jobs and their ability to pay for it. And for example, yesterday I was traveling through the west end of Puerto Rico where the eye of Maria passed, and I saw a line snaking around a baseball stadium in one town. And I talked to some people in the line and inside of what turned out to be a food distribution center for FEMA. FEMA comes there and distributes food, or actually the food from FEMA comes for a few hours every week. Local volunteers help bag it up and distribute it, and then they delivered to the elderly and disabled people who can't stand in line. This was yesterday, and I spoke to Zues Moreto, who lives in Aguada. He told me some of the food came through FEMA, and other donations come from churches and other countries like Columbia and Venezuela. And here’s the thing – there wasn’t an actual FEMA officer on site. In fact, I’ve seen one FEMA officer on the island – and he was off duty. BEVINGTON: Emily, besides these food delivery problems – we’re reading about deep infrastructure problems – 35% of Puerto Ricans still don’t have electricity – and there’s also a huge demand for clean drinking water. CURETON: That’s right Rickey. At the food distribution center, I met a woman named Gisella Cortez. She says access to potable water was the biggest problem right after the storm and it’s the biggest problem right now, almost four months later. She says they still don’t have running water at her house and her family started collecting rainwater for cleaning, showers and to flush the toilets. I asked her what she wants her fellow Americans on the mainland to hear right now. BEVINGTON: Getting back to Atlanta based Tiffany Brown and her so-called company Tribute Contracting – what does this mismanaged contract say about the greater recovery problems in Puerto Rico? CURETON: How one contract affects the situation in Puerto Rico is a tough question. But the case of Atlanta based Tiffany Brown raises the question: Are the winners of these contracts are making losers out of American tax payers – both in Puerto Rico and the rest of the country?